Alfresco Decking is a small Midlands based timber and composite deck building company that has extensive experience in the timber structure industry in areas such as Redditch, Bromsgrove, Stratford-upon-Avon, Droitwich, Worcester and all surrounding areas. 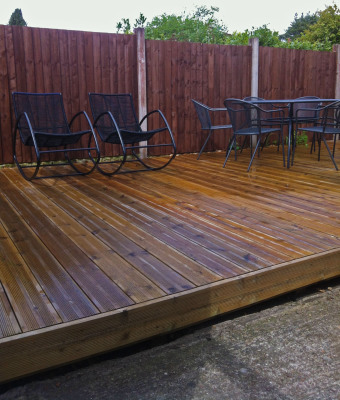 At Alfresco Decking we pride ourselves on providing the very best decking service for our customer’s needs. We have quality experienced tradesmen that are fully competent with the 'Timber Decking Association' s' guide lines to building a safe and secure solid structure for your garden that will last for years to come. As experienced deck builders we offer advice on how to get the best value for your money to suit your budget whether large or small. We love the outdoor lifestyle and really want you to embrace in it too so whether you want your decking to incorporate a fire pit, hot tub, pizza oven, garden trampoline or any other ideas you may want to work into your decking area, just let us know. Unfortunately here in the UK we have to make do with constant showers throughout the summer months, so why not have a timber framed pagoda above your decking with a Polycarb roof to keep you dry? Or for those rare occasions we do get them hot summer days, a shade sail to keep you nice, cool and out of the scorching sun? We can use our design and build experience to create you a truly beautiful 'one off' bespoke decking area totally unique to you own specific requirements. There are now hundreds of wonderful ideas online using reclaimed timber from pallets or scaffold boards, for things like box planter's and other garden furniture that we can build for you as finishing touches to really give it that little bit extra. So get your creative juices flowing as anything is possible. We serve Redditch, Bromsgrove, Alcester, Stratford-upon-Avon, Bidford, Lapworth, Hockley Heath, Studley, Alvechurch and ALL surrounding areas. 80% of our work is based around timber products and we like to make sure our wood is bought from sustainable sources like 'BSW Timber' who only use tree's that are grown in certified commissioned forests inside of the United Kingdom. Bring your old decking back to life! We offer extensive solutions to renovate and rejuvenate your existing decking. Bringing it back to life and preserving it for years to come. Up-cycled garden furniture is all the rage and most importantly its green! 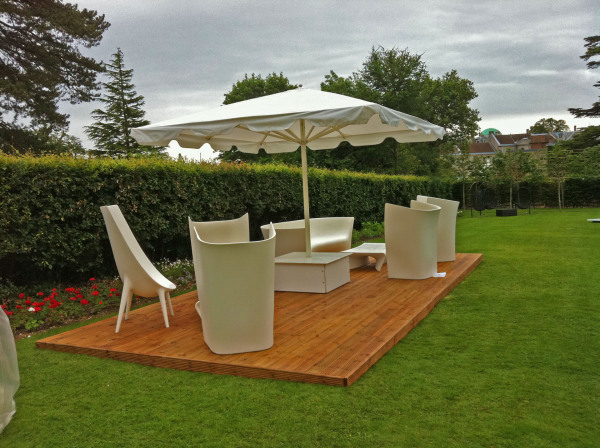 Speak to us about designing custom furniture for your decking space. Alfresco Decking Redditch design and construct beautiful, bespoke garden decks to suit all available garden spaces.